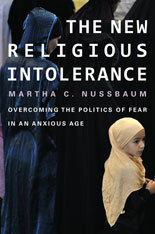 Fear, Nussbaum writes, is “more narcissistic than other emotions.” Legitimate anxieties become distorted and displaced, driving laws and policies biased against those different from us. Overcoming intolerance requires consistent application of universal principles of respect for conscience. Just as important, it requires greater understanding. Nussbaum challenges us to embrace freedom of religious observance for all, extending to others what we demand for ourselves. She encourages us to expand our capacity for empathetic imagination by cultivating our curiosity, seeking friendship across religious lines, and establishing a consistent ethic of decency and civility. With this greater understanding and respect, Nussbaum argues, we can rise above the politics of fear and toward a more open and inclusive future.